A dog has been sent to an early grave after attacking and biting a pupil to death earlier today in Port-Harcourt, River state. 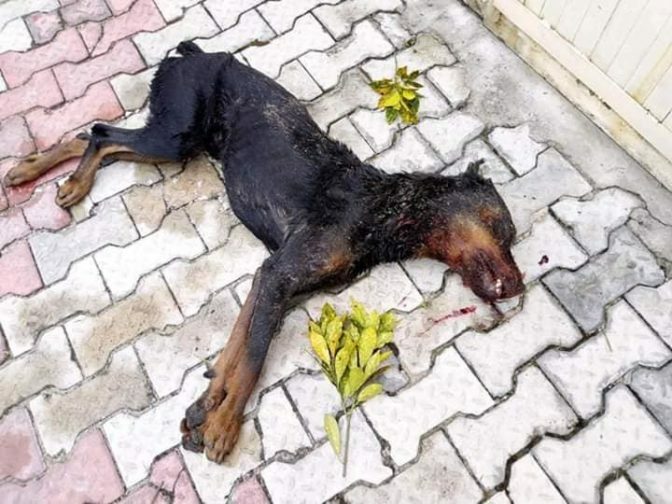 The unfortunate incident happened along Tessy road in Rumuagholu, off Rumuokoro area in the state capital as the young boy was bitten to death by the rampaging ROTTWEILER dog. It was gathered that the security guard at the house where the dog lived, opened the gate for the dog and it ran straight to a primary school (without fence), and attacked a pupil of the school. The dog was said to have also pounced on another child and bit her in the buttocks before an angry policeman shot the dog to death as claimed by Chuks Bune who recorded the incident. The second victim is receiving treatment at Spring Rose Hospital along Rumuagholu road. Report has it that the guard of the house where the dog escaped from has been arrested by the police.